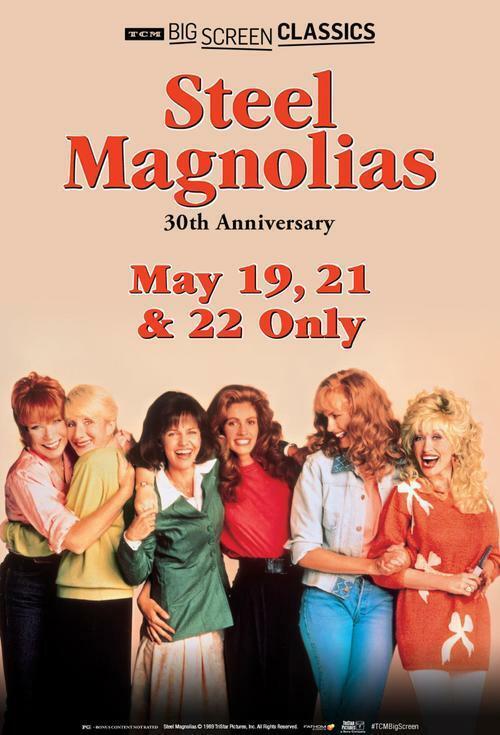 Fathom Events, TCM and Tristar pictures presents Steel Magnolias returning to select cinemas for a special 30th anniversary event. Six icons of the silver screen - Sally Field, Dolly Parton, Shirley MacLaine, Daryl Hannah, Olympia Dukakis and Julia Roberts - come together in this hilarious and heartwarming story of life, love and loss in a small Louisiana parish. At the center of the group is Shelby, newly married and joyfully pregnant, even though her diabetes could make childbirth life-threatening. Terrified at the possibility of losing her only daughter, M'Lynn looks to her four closest friends for strength and laughter as she battles her deepest fear of death to join Shelby in celebrating the miracle of new life. A classic story of family, strength in women, and big southern hair, the big screen is the perfect way to experience the Magnolia’s Louisiana charm and celebrate 30 years of Steel Magnolias. This anniversary event includes exclusive insight from Turner Classic Movies.